The mechanisms underlying the immunomodulatory functions of mesenchymal stem cells (MSC) on dendritic cells (DC) have been shown to involve soluble factors, such as IL-6 or TGF-β, or cell-cell contact, or both depending on the report referenced. In this study, we intend to clarify these mechanisms by examining the immunosuppressive effect of human adult MSC on adult DC differentiated from CD34+ hemopoietic progenitor cells (HPC). MSC have been shown to inhibit interstitial DC differentiation from monocytes and umbilical CD34+ HPC. In this study, we confirm that MSC not only halt interstitial DC but also Langerhans cell differentiation from adult CD34+ HPC, as assessed by the decreased expression of CD1a, CD14, CD86, CD80, and CD83 Ags on their cell surface. Accordingly, the functional capacity of CD34+ HPC-derived DC (CD34-DC) to stimulate alloreactive T cells was impaired. Furthermore, we showed that 1) MSC inhibited commitment of CD34+ HPC into immature DC, but not maturation of CD34-DC, 2) this inhibitory effect was reversible, and 3) DC generated in coculture with MSC (MSC-DC) induced the generation of alloantigen-specific regulatory T cells following secondary allostimulation. Conditioned medium from MSC cultures showed some inhibitory effect independent of IL-6, M-CSF, and TGF-β. In comparison, direct coculture of MSC with CD34+ HPC resulted in much stronger immunosuppressive effect and led to an activation of the Notch pathway as assessed by the overexpression of Hes1 in MSC-DC. Finally, DAPT, a γ-secretase inhibitor that inhibits Notch signaling, was able to overcome MSC-DC defects. In conclusion, our data suggest that MSC license adult CD34+ HPC to differentiate into regulatory DC through activation of the Notch pathway. Mesenchymal stem cells (MSC)4 constitute a small proportion of the bone marrow cell population. MSC can be expanded ex vivo without loss of their differentiation potential (1, 2). Further interest in their clinical application has emanated from the observation that MSC can inhibit T cell responses (3, 4, 5). This property has been used in several clinical settings; in particular, haploidentical MSC infusion could resolve severe, treatment-refractory, acute graft-vs-host disease (6). Nevertheless, the mechanisms underlying this immunosuppressive property remain to be clarified. Most of the data suggest that this property involves soluble factors (4, 7, 8, 9) and mechanisms mediated by cell-cell contact (5, 7, 8, 9, 10, 11). In addition, MSC are also likely to educate other cells involved in the induction of a specific immune response, like dendritic cells (DC). Interestingly, MSC have been shown to provide growth factor support for expansion of hemopoietic stem cells, like stem cell factor, Flt-3L, or GM-CSF also involved in DC differentiation (12). DC represent a rare population of extremely potent APCs. They are derived from CD34+ bone marrow stem cells, and myeloid DC can be generated in vitro either from peripheral blood monocytes, in the presence of GM-CSF and IL-4 (13), or from bone marrow CD34+ HPC, in the presence of GM-CSF and TNF-α (14). CD34+ HPC have been shown 1) to give rise to two DC subpopulations: the CD14+CD1a− cells, which are precursors of interstitial DC, and the CD14−CD1a+ cells, which are precursors of Langerhans cells, and 2) to proliferate during such differentiation. These two populations exert distinct functions (15). DC play a major role in the processing and presentation of Ags to different immune cells and have the unique capacity to prime naive T lymphocytes (16, 17). The transition from Ag-processing cell to APC is essential for DC to mount an immune response because immature DC fail to prime T cells effectively and rather promote tolerance induction (18, 19). The differentiation and maturation process, which promotes the polarization of naive T cells is associated with up-regulation of CD1a, class II MHC, T cell costimulatory molecules (CD80, CD86), and maturation markers, such as CD83 (20). Recently, MSC have been shown to inhibit differentiation and function of monocyte-derived DC (21) as well as cord blood CD34+ HPC-derived DC (CD34-DC) (22), to inhibit activation of DC1 and to increase IL-10 production by mature DC2 (23). In this study, we analyzed the effect of adult MSC on adult CD34+ myeloid DC at different states. Furthermore, we investigated the impact of these DC generated in coculture with MSC (MSC-DC) on T cell alloreactivity. Finally, we asked whether the immunosuppressive effect of MSC, was due to secretion of suppressive soluble factors or to a cell-cell contact mechanism. Cell-cell interaction is generally important in the hemopoietic system. Interactions between Notch receptors and Notch ligands constitute an evolutionarily conserved example of interactions between immune cells and their surrounding microenvironment (24). The role of Notch signaling in myeloid cell differentiation is much controversial. Thus, Cheng et al. (25) reported that the activation of Notch-1 and Notch-2 receptors with cell-bound Notch ligand does not result in differentiation of mature DC or macrophages, but causes accumulation of immature myeloid DC. However, in a more recent report, Jagged-1, a Notch ligand that is mostly expressed in bone marrow-derived stroma cells, stimulated accumulation of DC precursors but prevented their transition to terminally differentiated DC, whereas Delta-1 promoted generation of fully differentiated DC (26). In addition, Olivier et al. (27) have shown that Notch ligand δ-1 is a hemopoietic development cofactor for plasmacytoid DC. In this study because the direct coculture of MSC with CD34+ HPC resulted in a stronger immunosuppressive effect via cell-cell contact, we investigated the role of the Notch pathway in the interaction of bone marrow stroma cells on DC differentiation. We used the French National protocol to establish our MSC cultures. Bone marrow aspirates were obtained from the posterior iliac crest of healthy donors after their consent. Bone marrow mononuclear cells (MNC) were isolated by Ficoll density gradient centrifugation (Lymphoprep; Abcys). A total 2.5 × 105/ml MNC were seeded in α-MEM (Invitrogen Life Technologies) supplied with 10% FBS, 2 mM l-glutamine, and 100 U/ml penicillin-streptomycin. Cells were allowed to adhere for 48 h followed by the removal of nonadherent cells. Medium and nonadherent cells were removed every 3 days thereafter. Adherent cells were subcultured when they were confluent. Adherent cells were detached using trypsin and reseeded in a new flask to expand them. The third passage of cells was used for our experiments. MSC were identified by immunophenotypic criteria based on the expression of CD73, CD90, and CD105 and the absence of CD45, CD34, CD14, CD19, and HLA-DR expression. We used CFU fibroblast assay to evaluate the number of mesenchymal progenitors in the culture. The differentiation of MSC was assessed at the second or third passage cultures. Cells were cultured either in an osteogenic, chondrogenic, or adipogenic medium (data not shown). Preparation of conditioned medium from MSC cultures was performed by using MSC collected after the second passage. When cells were ∼60–70% confluent, culture medium was semichanged with fresh RPMI 1640 medium (Invitrogen Life Technologies). Supernatant was harvested 48 h later, filtered (0.2 μm pore size), and stored at −20°C. CD34+ cells were purified from MNC by using MACS and microbead-conjugated CD34 Abs according to the manufacturer’s recommendations (Miltenyi Biotec). Differentiation of DC was achieved by using 50 ng/ml GM-CSF, 10 ng/ml TNF-α, and 100 ng/ml Flt3-L (R&D Systems). At days 3 and 5, cultures were fed with fresh medium and cytokines. At day 8, cells were induced to mature by exposure to 100 ng/ml LPS for 48 h.
Cocultures were initiated by seeding MSC in a T 12.5 flask overnight at a concentration of 3 × 105 cells/well in RPMI 1640 medium as described. A total of 6 × 105 CD34+ cells/flask were seeded on the top of the MSC layer. The day after, differentiation of DC was achieved as described for CD34-DC. A titration of MSC to CD34+ cell ratio of 1:10, 1:5, 1:2, and 1:1, respectively, was performed. Cytokines were added to the cultures at days 0, 3, and 5. At day 8, DC were separated from MSC by spinning cells in suspension and then washing them. DC were induced to mature via LPS in the absence of MSC. Neutralizing anti-IL-6, anti-M-CSF, or anti-TGF-β mAbs were added at day 0, 3, and 6 at the concentration of 20, 20, and 10 μg/ml, respectively (R&D Systems). To appreciate the contribution of soluble factors and cell-cell contact mechanisms, Transwell chambers with a 0.4-μm pore size membrane (Corning) were used. MSC were cultured in the lower compartment, whereas CD34+ cells were seeded on the upper compartment. The Abs used for flow cytometry were FITC- or PE-conjugated mouse anti-human CD73, CD90, CD105, CD45, CD34, CD19, CD1a, HLA-DR, CD14, CD80, CD86, and CD83. Abs described were purchased from Immunotech except for CD1a, which was purchased from BD Pharmingen. The cultured cells were collected, washed twice, and resuspended in 200 μl of PBS containing 0.1% BSA. These cells were stained with specific labeled Abs or appropriate isotypic controls. The cells were incubated on ice for 30 min, washed with PBS containing 0.1% BSA, then fixed with a 1% paraformaldehyde solution. Analyses were performed using FACScan and CellQuest software (BD Bioscience). For intracellular staining of IFN-γ-producing T cells, purified CD3+ T cells at day 5 of a primary MLR were harvested, washed in PBS, and suspended in fresh RPMI 1640 medium supplemented with 10% SVF at the concentration of 5 × 105 cells/ml. They were then stimulated with 50 ng/ml PMA and 1 μg/ml calcium ionophore for 6 h at 37°C. For the last 4 h, Golgistop (BD Pharmingen) was added at a concentration of 2 μM to block cytokine secretion. Cells were washed and stained with anti-CD25, anti-CD28, anti-CD4, anti-CD8, or anti-CD69 mAbs (BD Pharmingen) for 20 min at 4°C. After wash in PBS, cells were fixed/permeabilized with Cytofix/cytoperm solution (BD Pharmingen) for 20 min at 4°C. After further washing, cells were stained with anti-IFN-γ Ab (BD Pharmingen) for 30 min at room temperature. At least 1 × 105 cells were analyzed in live gate with FACScan (BD Biosciences). For intracellular staining of CTLA-4 and FoxP3, lymphocytes were washed and suspended in PBS containing 0.1% BSA, and membrane staining of CD4 and CD25 was performed. Intracellular staining of FoxP3 (Abcam) was achieved as described for IFN-γ staining. DC were collected and used to stimulate alloreactive T lymphocytes. Graded doses of irradiated stimulator cells (10,000, when possible, or 5000, 2500, 1250, 625, 312) were seeded with 1 × 105 allogeneic T lymphocytes in round-bottom microtest tissue culture plates in complete RPMI 1640 with 10% human AB serum. Thymidine incorporation was measured on day 5 following an 18-h pulse with 1 μCi [3H]thymidine. Where specified, cell proliferation was also measured by the cell surface stain CFSE. Alloreactive T lymphocytes (5 × 106/ml) were stained with 5 μM CFSE. After 10 min, cells were washed twice in PBS with 10% FCS. After 72, 96, and 120 h cells were harvested and stained with CD4- and CD8-PE before acquisition on FACScan. On day 5, 1 × 105 lymphocytes were washed, purified with anti-CD3 magnetic beads (Miltenyi Biotec), and restimulated with 5 μg/ml anti-CD28 mAbs and 5 μg/ml anti-CD3 (UCHT1 clone) mAb (R&D Systems) in 100 μl of fresh RPMI 1640 medium. Alternatively, 1 × 104 alloreactive T lymphocytes were stimulated with 105 irradiated MNC from the same blood donor than that of DC or from a third-party blood donor. T cells were cultured for 3 days, in complete RPMI 1640 with 10% human AB serum. Thymidine incorporation was then measured following an 18-h pulse with 1 μCi [3H]thymidine. Primary MLR were performed by stimulating 105 CD4+ T cells previously purified with magnetic beads (Miltenyi Biotec) with 105 irradiated MNC that were harvested from the same donor than that of DC or from a third-party blood donor. Alloreactive T cells collected from primary MLR with DC were added to CD4+ T cells at the concentrations of one DC-primed alloreactive T cell for two unprimed CD4+ T cells (1:2) or 1:32. Then, cells were cultured in microtiter plates for 5 days, and thymidine incorporation was measured following an 18-h pulse with 1 μCi [3H]thymidine. DAPT (N-[N-(3,5-difluorophenacetyl)-l-alanyl]-S-phenylglycine t-butyl ester; Sigma-Aldrich) is an inhibitor of the γ-secretase responsible for the cleavage of Notch induced by ligand binding and a well-known inhibitor of the Notch signaling pathway (28). DAPT was added at 50 μM (Calbiochem; EMD Biosciences), in MSC-DC cultures, at days 0, 3, and 5. When culture medium was changed DAPT was added in the fresh medium at the same concentrations. Because DAPT was diluted in DMSO, the control MSC-DC were cultured with DMSO at the same concentration than DAPT, i.e., 50 μM. Total RNA was extracted from 1 × 106 total cells using TRIzol reagent (Invitrogen Life Technologies). One microgram of RNA was reverse transcribed using the Thermoscript RT-PCR system (Invitrogen Life Technologies) and PCR amplification was performed using a LightCycler instrument with FastStart DNA Master SYBR Green I real-time RT-PCR kit (Roche Molecular Biochemicals). Specific amplification of genes of interest include the following: IL-12, IL-10, TGF-β, FoxP3, IL-2, IFN-γ, GATA-3, CD3, cyclophilin B were performed using the LightCycler primer set kits, according to the manufacturer’s instructions (Roche Molecular Biochemicals). Cyclophilin B was used as a housekeeping gene, as previously reported (29). Thermocycling was performed with 45 cycles of amplification (10 s at 95°C, 10 s at 68°C, and 16 s at 72°C). The levels of expression of each mRNA and their estimated crossing points were determined relative to the standard preparation using the LightCycler computer software. The results are based on the ratio of genes of interests to cyclophilin B or CD3 mRNA amplification. For Notch-1 and Notch-2 receptors, Hes1 and Hey1 gene total RNA were extracted from 2 × 105 total cocultured cells using SV total RNA isolation system (Promega) and were reverse transcribed using random hexamers according to the manufacturer’s instructions (Superscript First Strand synthesis system for RT-PCR; Invitrogen Life Technologies). PCR primers sequences were as follows: Notch-1 (forward) CGGGCGACGTCACCC, (reverse) TCGTCGATATTTTCCTCACAGTTC, (probe) CCTGCCAGGCTTCACCGGCC; Notch-2 (forward) CTGTGCTGCGCGGCC, (reverse) TTCCTTCATTTACACAGGGTTCATAG, (probe) CGCATGCATTGCAGTGTCGAGATG; Hes1 (forward) TGGAAATGACAGTGAAGCACCT, (reverse) GTTCATGCACTCGCTGAAGC, (probe) GCGAGATGACGGCTGCGCTG; and Hey1 (forward) GCATACGGCAGGAGGGAAA, (reverse) TCCCAAACTCCGATAGTCCATAG, (probe) TACTTTGACGCGCACGCCCT. Expression of target gene was normalized using the endogenous gene HPRT with the following primers: (forward) GGCAGTATAATCCAAAGATGGTCAA, (reverse) TCAAATCCAACAAAGTCTGGCTTATAT, (probe) CTTGCTGGTGAAAAGGACCCCACGA) (TaqMan Predeveloped Assay Reagents; Applied Biosystems). Data were expressed as a percentage of mean positivity ± SD. The two-tailed Student’s t test was performed to compare two or more mean values. A probability of null hypothesis <5% (p ≤ 0.05) was considered statistically significant. To address whether MSC impair DC differentiation from adult CD34+ HPC, highly enriched CD34+ cells (>95% purity) were cocultured in the presence of GM-CSF (50 ng/ml), Flt3-L (100 ng/ml), and TNF-α (10 ng/ml) cytokines with MSC or without. After 8 days of culture, immature DC were harvested and counted. As expected, and as shown in Fig. 1⇓A, CD34+ HPC were able to differentiate into both CD14−CD1a+ and CD1a−CD14+ DC with a final yield of 12.1- ± 6.1-fold (mean ± SD, n = 14 donors). However, in the presence of MSC, both subpopulations of DC were decreased (Fig. 1⇓A) and their proliferation rate was reduced because only a 4.3- ± 4.1-fold (mean ± SD, n = 13 donors) increase in cell number was observed (data not shown). The impact of MSC on the expression of CD80, CD86, HLA-DR, and CD83 molecules was also investigated and showed a marked decrease, as compared with classical CD34-DC. Immature DC are able to mature following exposure with LPS, therefore we cultured 8-day-old CD34-DC or 8-day-old MSC-DC with LPS, but in the absence of MSC, for an additional 2 days. As shown in Fig. 1⇓, B and C, and as expected, LPS treatment of CD34-DC resulted in the increase of costimulatory molecule expression, appearance of CD83, decreased IL-10 but increased IL-12 mRNA expression. In contrast, MSC-DC expressed high levels of IL-10 mRNA at both days 8 and 10, but no IL-12 mRNA at day 10. Therefore, these results strongly suggest that coculture of CD34+ HPC with MSC inhibit their differentiation into mature DC. To define the best MSC to CD34+ cell ratio for the most efficient inhibition of DC differentiation, different ratios of MSC to CD34+ cells were used. As shown in Fig. 1⇓D both the 1:2 and 1:1 MSC to CD34+ cell ratios inhibited DC differentiation at the highest level. Therefore, the 1:2 MSC to CD34+ cell ratio was chosen in the following experiments. Human MSC inhibit the initial proliferation and differentiation of CD34+ HPC into interstitial DC and Langerhans cells. A total of 5 × 106 cells/well of human CD34+ HPC were cultured for 8 days in GM-CSF, TNF-α, and Flt-3L without (−MSC) or with (+ MSC) MSC. A, DC were stained for CD1a and CD14 markers. B, The phenotype of DC was also characterized by HLA-DR and T cell costimulatory molecule expression (CD80, CD86). At day 8, cells were induced to mature by exposure to 100 ng/ml LPS for 48 h in the absence of MSC, and analyzed at day 10 for the same markers, together with CD83 expression. Negative control (open histogram) and stain with the indicated relevant mAbs (filled histogram) are shown. C, IL-10 and IL-12 mRNA expression by MSC-DC/CD34-DC, at days 8 and 10, were measured by quantitative RT-PCR, relative to cyclophilin B (CPB) mRNA levels, a housekeeping gene used as control. D, Expression of CD14, CD1a, and CD86 by CD34-derived DC in MSC/CD34 cocultures at ratios ranging from 1:1 to 1:10 was assessed by flow cytometry. The percentage of positive ungated cells is shown. These phenotypes are representative of at least five individual experiments with different donors. Results are represented as mean ± SD of at least three individual experiments. ∗, p < 0.05. To evaluate the impact of MSC on DC function, we then measured their capacity to stimulate alloreactive T cells in an MLR assay. However, because MSC are known to induce a suppressor effect on T cells, DC were separated from MSC at day 8, by collecting cells in suspension and washing them. DC were then induced to mature in the presence of LPS. The absence of viable MSC in days 8 and 10 MSC-DC was further assessed by CD73 and CD45 staining (data not shown). As shown in Fig. 2⇓A, MSC-DC strongly inhibited T cell proliferation in response to alloantigens. Moreover, in accordance with data shown in Fig. 1⇑D, the 1:2 and 1:1 MSC to CD34+ cell ratio was the most efficient in blocking the allostimulatory capacity of MSC-DC (Fig. 2⇓B). MSC inhibit the allostimulatory capacity of adult CD34-DC, and lead to down-regulation of T cell activation marker expression and IFN-γ secretion in alloreactive T cells, independently on IL-10 secretion by DC. On day 10, graded doses of DC that have been cocultured in the absence (− MSC) or presence (+ MSC) of MSC were seeded with 1 × 105 allogeneic CD3+ T lymphocytes. Thymidine incorporation was measured on day 5 by an 18-h pulse with 1 μCi [3H]thymidine. The y-axis depicts [3H]thymidine incorporation by responder cells. A, Data are representative of at least three individual experiments. T cells were stimulated in a primary MLR assay, with graded doses of allogeneic DC that were cocultured with MSC at different ratio. B, Data are representative of three individual experiments. T cell proliferation was also measured by cell surface staining with CFSE. Alloreactive CD3+ T lymphocytes were stained with CFSE, harvested after 120 h and stained with CD4- or CD8-PE before acquisition on FACScan. C, FACS plots are ungated and representative of four independent experiments. Allogeneic mature DC cocultured without (− MSC) or with (+ MSC) MSC were used to stimulate purified CD3+ T cells in a primary MLR. At day 5, the expanded T cells were harvested, washed in PBS, and resuspended in fresh medium for intracellular staining of IFN-γ and surface staining of anti-CD4, anti-CD25, anti-CD28, and anti-CD69. For IFN-γ staining, T cells were activated for 6 h with PMA/ionomycin and treated with brefeldin A for the last 4 h of cultures. Cells were permeabilized and the proportion of CD4+/IFN-γ+ T cells was quantified. FACS plots are ungated and representative of three experiments of identical design. The percentage of positive cells is shown as mean ± SD from three separate experiments. D, Neutralizing anti-IL-10 Ab (10 μg/ml) was added at the beginning of the MLR assays. ∗, p < 0.05. E, Proliferation of responder cells was measured by [3H]thymidine incorporation. Results are representative of three independent experiments. To investigate the effect of MSC-DC on the number of T cell divisions, purified CD3+ T cells were stained with the cell surface dye CFSE before allogeneic stimulation with CD34-DC (control) or MSC-DC. After each round of T cell division, the intensity of CFSE is reduced and can be quantitated using flow cytometry. Therefore, T cell divisions were measured at day 5, using this technique. As shown in Fig. 2⇑C, 83% of CD4+ T cells did not divide in the presence of allogeneic MSC-DC, as compared with 23% of CD4+ T cells in response to allogeneic CD34-DC (n = 4 donors). Similar results were observed with CD8+ T cells (data not shown). 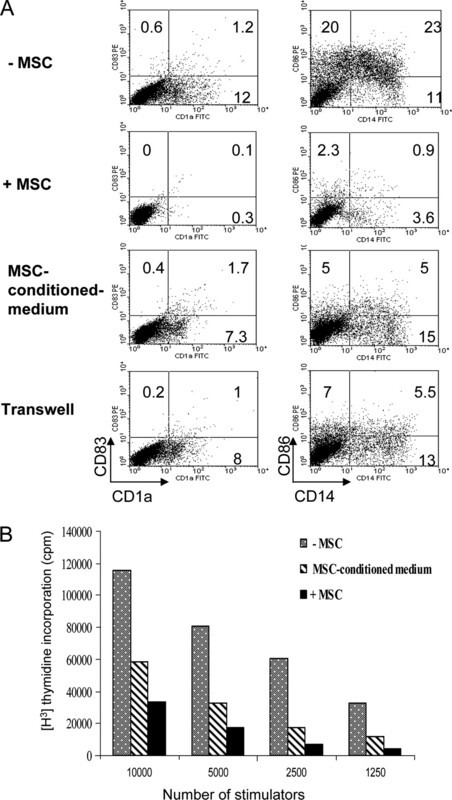 Altogether these data demonstrate that MSC-DC are deficient in their capacity to stimulate CD4+ and CD8+ T cell proliferation to alloantigens. We then investigated the effect of MSC-DC on alloreactive T cells, by analyzing 1) their capacity to produce intracellular IFN-γ and 2) their expression of activation markers such as CD25, CD69, and CD28. Fig. 2⇑D shows a representative staining. In accordance with results shown in Fig. 2⇑, B and C, we observed that the proportion of CD4+ T cells expressing intracellular IFN-γ in response to alloantigen was significantly reduced in the presence of MSC-DC because only 6.7 ± 2.7% of CD4+ T cells were able to secrete IFN-γ, as opposed with 15.2 ± 3.7% in the presence of classical CD34-DC. Similar results were obtained with CD8+ T cells (data not shown). Moreover, the expression of CD25, CD69, or CD28 activation molecules was impaired in the presence of MSC-DC. Therefore, these results show that when DC are cocultured with MSC, production of IFN-γ, as well as expression of activation markers, are impaired in T cells. Finally, because MSC-DC expressed high levels of IL-10 mRNA at day 10, we then evaluated whether the inhibition of the T cell alloresponse was related to IL-10 secretion. With this aim, 10 μg/ml anti-IL-10 mAb were added to MLR, from the beginning of cultures. As shown in Fig. 2⇑E, anti-IL-10 mAbs did not overcome the inhibitory effect of MSC-DC on T cell proliferation, demonstrating thus that the inhibition of the T cell alloresponse might result from other mechanisms than a direct MSC-DC-mediated IL-10 suppressive effect. To further investigate the mechanisms that lead to inhibition of the alloresponse by MSC-DC, we isolated T cells from primary MLR, washed them, and purified them with anti-CD3 magnetic beads. 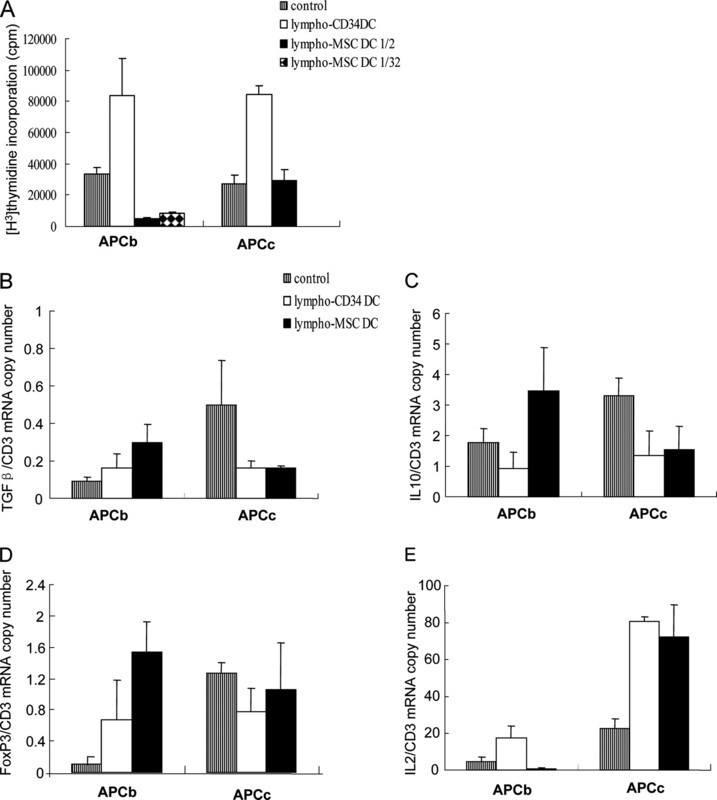 Then, CD3+ T cells were either stimulated with allogeneic APCs harvested from the same blood donor as DC (APCb) or with APC from a third-party blood donor (APCc). In parallel, T cells were stimulated with anti-CD3/CD28 mAbs. Results shown in Fig. 3⇓A demonstrate that, as compared with allogeneic CD34-DC primed T cells, T cells issued from primary MLR with allogeneic MSC-DC, once secondarily stimulated with the same alloantigen, expressed higher levels of TGF-β and FoxP3 mRNA, but absolutely no IL-2. In contrast, when stimulated with third-party donor APCs, T cells did not show any increase in cytokine mRNA levels, as compared with allogeneic CD34-DC-primed T cells. It has to be noticed that IL-2 was expressed as almost similar levels than control T cells. When anti-CD3/CD28 mAbs were used to stimulate MSC-DC-primed alloreactive T cells, this action resulted in the up-regulation of TGF-β, IL-10, and IL-2, but not FoxP3 mRNA levels, as compared with allogeneic CD34-DC-primed T cells. Altogether, these results suggest that secondary allostimulation induces generation of FoxP3-expressing T cells, only when the same alloantigen is presented to T cells, whereas secondary stimulation with anti-CD3/CD28 stimulation overcomes the inhibitory effect induced by MSC-DC. Differential effect of secondary stimulation with anti-CD3/CD28 mAbs or allogeneic cells on MSC-DC-primed alloreactive T cells. On day 5 of primary MLR culture with allogeneic CD34-DC or MSC-DC, T cells were purified with anti-CD3 magnetic beads. They were then stimulated with either allogeneic APCs harvested from the same blood donor than DC (APCb) or with APC from a third-party blood donor (APCc). A, IL-10, TGFβ, Foxp3, and IL-2 mRNA expression were measured by RT-PCR. B, In parallel, T cells were stimulated with anti-CD3/CD28 mAbs. Results are representative of two independent experiments. ∗, p < 0.05. Because upon the secondary alloresponse, MSC-DC-primed T cells did not express any IL-2 mRNA, but increased TGF-β and FoxP3 mRNA levels, we then investigated whether stimulation with MSC-DC could induce generation of regulatory T cell. With this aim, MSC-DC-primed alloresponsive T cells were added to MLR performed among unprimed blood T cells and irradiated APC from the same blood donor as DC or from a third-party blood donor. As shown in Fig. 4⇓A, MLR against APC from the same blood donor as DC, but not APC from a third-party donor, was strongly impaired when T cells issued from MLR with MSC-DC were added to the MLR assay at the 1:2 ratio. Interestingly, when the 1:32 ratio was tested, less inhibition was observed. As expected, when APC from a third party donor were used, proliferation was not inhibited. Moreover, when T cells issued from MLR with allogeneic CD34-DC were added to MLR cultures, this resulted in increased T cell proliferation of unprimed T cells against APC from both donor groups (Fig. 4⇓A). Interestingly, once again, TGF-β and FoxP3 mRNA levels were increased in the conditions in which T cell regulation was observed, whereas IL-2 production was abrogated (Fig. 4⇓, B, D, and E). Finally, although IL-10 mRNA level expression was increased in the presence of APC from the same donor as DC (Fig. 4⇓C, APCb), inhibition of T cell proliferation by MSC-DC alloreactive T cells was not overcome by anti-IL-10 mAbs (data not shown). In conclusion, we have shown in this experiment that allogeneic stimulation with MSC-DC can lead to the generation of T cells that exert an alloantigen-specific regulatory activity, which is not related to IL-10 secretion. 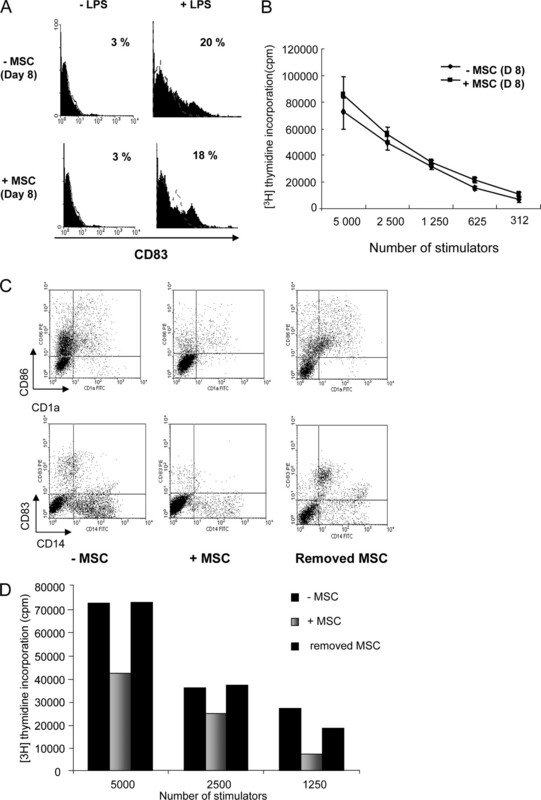 MSC-DC induce generation of allospecific regulatory T cells. Primary MLR were performed by stimulating 105 CD4+ naive T cells previously purified with magnetic beads with 105 APC harvested from the same blood donor than DC (APCb) or with APC from a third-party blood donor (APCc). Alloreactive T cells collected from the primary MLR primed with CD34-DC or MSC-DC were added to the culture at the concentrations of one alloreactive T cell for two CD4+ T cell (1:2) or 1:32. Proliferation of T cells was measured by thymidine incorporation (A). TGF-β (B), IL-10 (C), FoxP3 (D), and IL-2 (E) mRNA expression were measured by RT-PCR. Culture of primary MLR without adding DC-primed alloreactive T cells was used as control. Results are representative of two independent experiments. Because we have observed that MSC inhibit DC differentiation and maturation when added at the beginning of cultures (Fig. 1⇑), we then asked whether MSC could also affect already differentiated DC. With this aim, day-8 CD34+ HPC-derived immature DC were induced to mature with LPS for 2 days in the absence or presence of MSC. According to data shown in Fig. 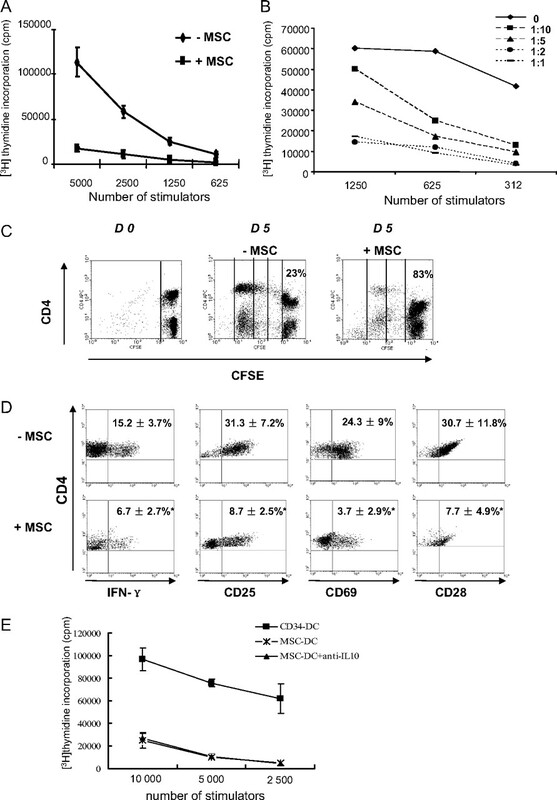 1⇑B, addition of MSC starting from day 0 prevented the appearance of CD83. However, as shown in Fig. 5⇓A, coculture of immature DC with MSC did not inhibit the neo-expression of CD83, a maturation marker. Neither was expression of CD80 and CD86 costimulatory molecules altered (data not shown). Moreover, the allostimulatory capacity of CD34-DC was not inhibited when MSC were added to immature DC at day 8 (Fig. 5⇓B) as opposed to the capacity of DC cultured with MSC from day 0 (Fig. 2⇑A). These data suggest that MSC inhibit DC commitment from CD34+ HPC and subsequently DC maturation; however, MSC do not affect the maturation process of DC, once they are already committed into immature DC. Inhibition of DC differentiation and maturation starts at the committed stage and is reversible. MSC were added, or not, to differentiated immature CD34-DC at day 8, before exposure to LPS (day-8 coculture DC). These DC were induced to maturation by LPS 100 ng/ml for 48 h. A, The expression of CD83 in the absence (top) or presence (bottom) of MSC in day-8-cultured DC was analyzed. These phenotypes are representative of at least three individual experiments. The percentage of positive ungated cells is shown. Negative control (open histogram) and stain with the indicated relevant mAbs (filled histogram) are shown. B, Primary MLRs with day-8 MSC-cocultured DC were performed. Data are representative of at least three individual experiments. CD34+ HPC that have been cultured with GM-CSF, Flt3-L, and TNF-α for 8 days in the presence of MSC (at a ratio of 1:2) were harvested, washed intensely, and then incubated again in GM-CSF, Flt3-L, and TNF-α in the absence of MSC for another 8 days (removed MSC). C, Cells positive for CD1a, CD14, CD86 and CD83 are shown. D, Immature DC cocultured without (− MSC) or with (+ MSC) MSC, or with but secondary removed MSC, were used to stimulate allogeneic T cells. Thymidine incorporation is expressed as cpm. Results (C and D) are representative of three individual experiments of identical design. We then investigated whether the effect of MSC on the differentiation of DC from CD34+ HPC was reversible or not. MSC-DC were harvested at day 8, washed thoroughly, and then incubated with GM-CSF, Flt3-L, and TNF-α in the absence of MSC for another 8 days. Under these conditions, not only their cell rates markedly increased (data not shown), but MSC differentiation into DC was also restored, as assessed by increased levels of CD1a, CD86, and CD83 molecule expression (Fig. 5⇑C). Moreover, when the allostimulatory capacity of these DC was measured in MLR assays, T cell proliferation to alloantigens was equivalent, whether or not DC were cultured with MSC, in a former step (Fig. 5⇑D). Therefore, these findings indicate that the inhibition of DC differentiation by MSC is reversible. The MSC inhibitory effect on CD34+ HPC commitment into DC can be mediated by soluble factors or can require cell-cell contact to be exerted. To answer this question, MSC conditioning medium was added to CD34+ HPC during their differentiation into DC in the presence of the relevant cytokines. In parallel, the Transwell chamber system was used to separate CD34+ HPC in the upper compartment from MSC in the lower compartment. As shown in Fig. 6⇓A, flow cytometry analysis of the CD1a, CD14, and CD86 markers showed that direct contact between CD34+ cells and MSC was the most powerful in impairing DC differentiation. In addition, results obtained with MSC conditioning medium and cocultures through a Transwell system, demonstrated a partial inhibition of DC differentiation, in both cases, as assessed by decreased expression of CD1a, CD14, and CD86. The alloresponses obtained in MLR with these different conditions correlated with results obtained in flow cytometry because the strongest inhibition of MLR was observed when DC were cocultured in direct contact with MSC (Fig. 6⇓B). MSC-mediated inhibition was not reversed with the addition of anti-IL-6 (20 μg/ml), anti-M-CSF (20 μg/ml), or anti-TGF-β (10 μg/ml) neutralizing mAbs (data not shown). These results suggest thus that both secretion of soluble factors and cell-cell contact are involved in the mechanisms that lead to inhibition of DC commitment from CD34+ HPC by MSC. MSC mediate most of their inhibitory effect through cell-cell contact-dependent mechanisms. In the Transwell chamber system separating MSC from CD34+ HPC (Transwell) or in a coculture with MSC-conditioned medium, expression of CD1a, CD14, CD86, and CD83 molecule in DC was measured. A, The percentage of positive ungated cells is shown in the FACS plots. B, The proliferative function of these cultured DC was measured in MLR. The y-axis depicts [3H]thymidine incorporation by responder cells. The x-axis depicts the number of stimulator cells. Both experiments represent one of three individual experiments of identical design. Direct contact between CD34+ cells and MSC was the most powerful mechanism for induction of the inhibitory effect on DC differentiation. The possible involvement of Notch signaling through stroma cells in DC differentiation has been shown in a mouse model and in the development of plasmacytoid DC (26, 27). Therefore, we hypothesized that MSC contact with HPC would modulate Notch receptor expression. For this purpose, we analyzed the mRNA expression of Notch-1 and Notch-2 receptors by RT-PCR, at days 0, 3, 5, and 8 of the culture, in CD34-DC and MSC-DC. Indeed, the ratio of MSC-DC and CD34-DC mRNA expression of Notch-2 but not Notch-1 receptor was increased 4.4- ± 1.3-fold at day 8 as compared with day 0 (p < 0.01) (Fig. 7⇓, A and B). MSC-DC enhance the expression of the Notch receptor, Hes1 and Hey1 mRNA. Ratio of Notch-2 receptor (A), Notch-1 receptor (B), Hes1 (C), and Hey1 (D) (Notch receptors target genes) expression by MSC-DC and CD34-DC at days 0, 3, 5, and 8 was assessed by RT-PCR. HPRT is the quantitative control. Results are represented as mean ± SD of relative mRNA levels of three experiments for all the time points and five experiments for days 0 and 8. A probability of null hypothesis <5% was considered statistically significant. ∗, p ≤ 0.05. Hes1 and Hey1 are one of the main target genes regulated by Notch (30). We, therefore, evaluated by RT-PCR Hes1 and Hey1 mRNA expression after incubation of CD34+ HPC with MSC at days 0, 3, and 8 of the coculture. The ratio of MSC-DC and CD34-DC Hes1 and Hey1 mRNA expression increased overtime to a peak of 25- ± 12-fold (p = 0.05) and 7- ± 4-fold (p = 0.07) at day 8 compared with day 0, respectively (Fig. 7⇑, C and D). These data suggest that MSC contact with CD34+ HPC activates the Notch pathway, and that Notch signaling may take part into the inhibition of DC. To demonstrate that Notch signaling is responsible for the immunosuppressive effects of MSC on HPC differentiation into CD34-DC, we tested the effects of DAPT, an inhibitor of the γ-secretase responsible for the cleavage of Notch induced by ligand binding (28). As expected, DAPT decreased the levels of Hes1 at days 5 and 8 (Fig. 8⇓A). Concomitantly, the inhibition of Notch signaling by DAPT resulted in the complete overcome of DC phenotype as shown by increased costimulatory molecule expression and IL-12 secretion (Fig. 8⇓, B and C). Of note, DATP had no effect on Notch-2 receptor (data not shown), suggesting that the increase of Notch-2 receptor is independent of the Notch pathway. However, overexpression of Notch-2 receptor might reflect the phenotype of the heterogeneous DC population at day 8. The inhibition of Notch signaling by DAPT results in the complete overcome of DC phenotype and functions. DAPT (50 μM) was added to MSC/CD34+ cells cocultures on days 0, 3, and 5. On day 8, cells were collected and induced to mature with LPS for 48 h (DAPT-DC). The same concentration of DMSO was added as control (MSC-DC). A, Hes1 mRNA expression was analyzed on days 0, 5, and 8. 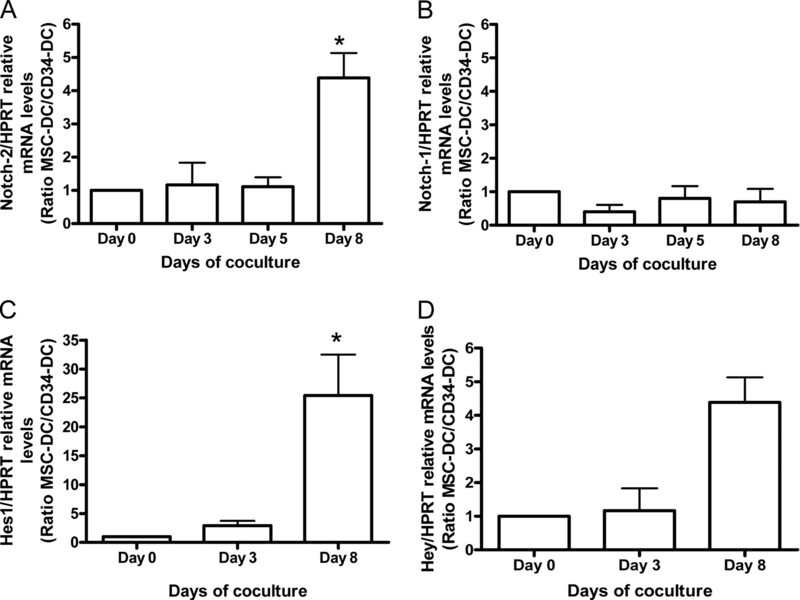 IL-10 and IL-12 mRNA expression, phenotype, and allogeneic stimulatory capacity of day-10-cultured DC were analyzed (B–D). E, IFN-γ mRNA expression in lymphocytes primed with these DC was measured by RT-PCR. Results are representative of three independent experiments. A probability of null hypothesis <5% was considered statistically significant. ∗, p ≤ 0.05. We then evaluated the influence of Notch signaling on DC functions by using DAPT, as shown in Fig. 8⇑, D and E. DMSO-treated MSC-DC were impaired in their function, as opposed with DAPT-treated MSC-DC because DAPT treatment resulted in increased allostimulatory capacity and IFN-γ secretion by alloreactive T cells. Thus, altogether, these results demonstrate that the Notch signaling pathway is likely involved in the impairment of DC differentiation and function by MSC. Data presented in this study indicate that allogeneic MSC inhibit commitment of adult CD34+ HPC into DC. These MSC-DC can be considered as regulatory DC because 1) they expressed high IL-10, but low IL-12 mRNA levels, 2) they inhibited the proliferation and function of alloreactive T cells, and 3) they induced the generation of alloantigen-specific regulatory T cells expressing both FoxP3 and TGF-β mRNA. However, inhibition of T cell functions was independent of IL-10 secretion by either DC or T cells. Finally, we showed that the inhibitory effect of MSC on DC differentiation is mostly mediated through cell-cell contact mechanisms via the activation of the Notch pathway. We found that human MSC inhibit adult CD34-DC differentiation. This finding is in agreement with recent studies showing the capacity of MSC to alter DC function (21, 22, 23, 31). However, in our report, we focused on adult CD34-DC, which derive directly from bone marrow, as do MSC. In our coculture system, MSC were shown to halt CD34+ HPC to differentiate into both Langerhans CD1a+ and interstitial CD14+ DC subsets. This finding suggests that MSC operate through a mechanism that is not specific for adult interstitial DC. Nauta et al. (22) have demonstrated in their culture system that MSC prevent differentiation of CD14+ precursors into CD1a+ DC from umbilical CD34+ HPC but not development of Langerhans cells. This discrepancy could be related to different MSC-mediated inhibitory mechanisms in cord blood vs adult hemopoietic pathways. Indeed, whereas we have demonstrated that MSC inhibited adult HPC commitment into DC, at the first stage of differentiation. Nauta et al. (22) have reported that the impact of MSC on cord blood HPC differentiation occurred at the maturation stage (from day 6 to day 12). Thus, altogether, in addition to their well-known action on T cells (3, 4, 5), our data suggest that MSC infused in patients are likely to act on adult CD34-DC. In agreement with our data, other stroma cell types, like fibroblasts or splenic stroma cells, have also been shown to halt differentiation or function of DC (32, 33). However, although addition of TNF-α at the onset of fibroblast/monocyte coculture was able to reverse the skewing effect of fibroblasts, addition of TNF-α at the initial MSC/monocyte cocultures did not generate DC (21). Accordingly, in this study we observed that MSC/CD34+ HPC cocultures led to inhibition of DC differentiation, even though cells were cultured in the presence of TNF-α from the onset of the culture. However, in disagreement with what was shown in monocyte-derived DC by Jiang et al. (21), CD34-DC differentiation was impaired by MSC treatment only when MSC were added at the onset of the culture. Moreover, upon removal of MSC, CD34+ HPC could be reinduced to differentiate into CD1a and CD14 DC. Thus, our results suggest that the impairment of CD34-DC differentiation by MSC in the bone marrow might occur at certain conditions only, which might depend on the concentration ratio of MSC and CD34+ HPC, on the physical distance between MSC and HPC, or on other unknown factors. Naive T cell differentiation into Th1 or Th2 effectors depends on the local environment, like the type and activation state of DC. In our system, coculture of MSC with DC resulted in decreasing HLA class II and costimulatory molecule expression and in impairing the Th1 response, as shown by a reduced number of IFN-γ-producing T cells. However, our data did not show a Th2 skewing because mRNA expression of GATA-3 was not significantly increased in any conditions (data not shown). Because MSC were not present in the MLR when T cells were stimulated with DC, our results suggest an indirect effect of MSC on modulation of T cell function through DC commitment inhibition. Whereas two previous studies have shown that MSC directly mediate activation of regulatory CD4+CD25+ T cell subsets (23, 34), our data did not demonstrate a direct expansion of naturally occurring CD4+CD25+FoxP3+ regulatory T cells. However, we demonstrated that MSC-DC indirectly induced the generation of TGF-β- and FoxP3-expressing T cells at the secondary MLR (Fig. 3⇑). Moreover, we showed that these T cells exerted alloantigen-specific regulatory functions (Fig. 4⇑). Regulatory DC have been reported to secrete large amounts of IL-10, but low IL-12 and to induce the generation of regulatory T cells (35, 36). Jiang et al. (21) also have shown that MSC-cocultured monocyte-derived DC secrete high amount of IL-10 and reduced IL-12. But in the report by Nauta et al. (22), MSC did not induce IL-10 production by cocultured CD34-DC, which is in discrepancy with our results. Therefore, together with our results showing that 1) MSC are likely to inhibit adult CD34-DC commitment, but not maturation and 2) cell-cell contact mostly account for this inhibition, these results suggest that MSC might use different inhibitory mechanism pathways to inhibit adult vs cord blood HPC differentiation into DC. We have shown that the effect of allogeneic MSC on adult CD34-DC differentiation is mediated by both contact-dependent and -independent mechanisms, whereas the effect of MSC on monocyte-derived DC has been shown by other studies to mostly depend on soluble factors, such as IL-6, TGF-β, and M-CSF (21, 22). Our results did not show an effect of these cytokines on inhibition of DC differentiation, suggesting that other cytokines or soluble factors, such as PGE2, might be involved. IDO could be another hypothesis because increased expression of IDO has been shown to be involved in a direct bone marrow stroma cell-T cell interaction model (8). We have shown that cell-cell interaction play a major role. More precisely, our data showed that expression of Hes1 and Hey1 genes were increased overtime in MSC-DC as compared with CD34-DC and thus supported the assumption that the contact of MSC with HPC could prevent terminal differentiation of these cells into DC via the activation of Notch signaling. This observation was further confirmed when the inhibition was completely reverted by the use of DATP, an inhibitor of Notch signaling, which indeed abrogated Hes expression in MSC-DC. It is thus likely that the Notch pathway was activated by increased Notch-2 receptor expression on DC by MSC. In conclusion, we show in this study that human bone marrow MSC inhibit adult CD34+HPC commitment into myeloid DC. 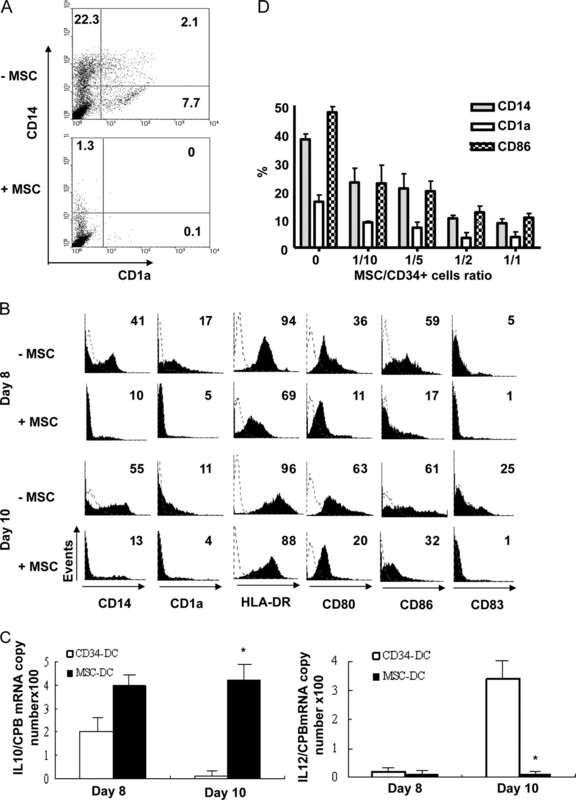 Both interstitial DC and Langerhans cell differentiation were halted and in turn, MSC-DC inhibited alloreactivity of T cells, and induced generation of alloantigen-specific regulatory T cells. Because MSC-DC were also able to express large amounts of IL-10 cytokine, but no IL-12, our results suggest that these MSC-DC were likely to be regulatory DC. Finally, our results suggest that the molecular mechanism underlying the effect of human bone marrow-derived MSC through cell-cell contact involved the activation of the Notch signaling pathway. We express special thanks to Dr. Pavan Reddy for critically reading the manuscript. We thank all the clinicians from the Bone Marrow Unit (Centre Hospitalier Université de Nancy, Vandoeuvre-lès-Nancy, France), in particular Dr. Alexandra Salmon, for excellent help with healthy donor sample accrual. We thank Dr. Luc Sensebe and Alain Langonné for providing the French National MSC culture protocols. We thank Marie-Josée Monnier and Brigitte Serrurier for excellent help with follow-up of samples and regulatory issues. We thank Dr. Véronique Latger-Canard, Gilles Antoine, Françoise Gilbert, and all the flow cytometry team (Centre Hospitalier Université de Nancy, Vandoeuvre-lès-Nancy Nancy, France) for precious time and help in the flow cytometer analysis. ↵1 This work was supported in part by la Ligue Nationale contre le Cancer Meurthe et Moselle. Y.-P.L. is a recipient of French foreign government department fellowship. ↵2 Y.-P.L. and S.P. contributed equally to this work. ↵4 Abbreviations used in this paper: MSC, mesenchymal stem cell; DC, dendritic cell; HPC, hemopoietic progenitor cell; MNC, mononuclear cell; CD34-DC, CD34+ HPC-derived DC; MSC-DC, DC generated in coculture with MSC. Pittenger, M. F., A. M. Mackay, S. C. Beck, R. K. Jaiswal, R. Douglas, J. D. Mosca, M. A. Moorman, D. W. Simonetti, S. Craig, D. R. Marshak. 1999. Multilineage potential of adult human mesenchymal stem cells. Science 284: 143-147. Reyes, M., T. Lund, T. Lenvik, D. Aguiar, L. Koodie, C. M. Verfaillie. 2001. Purification and ex vivo expansion of postnatal human marrow mesodermal progenitor cells. Blood 98: 2615-2625. Bartholomew, A., C. Sturgeon, M. Siatskas, K. Ferrer, K. McIntosh, S. Patil, W. Hardy, S. Devine, D. Ucker, R. Deans, et al 2002. Mesenchymal stem cells suppress lymphocyte proliferation in vitro and prolong skin graft survival in vivo. Exp. Hematol. 30: 42-48. Di Nicola, M., C. Carlo-Stella, M. Magni, M. Milanesi, P. D. Longoni, P. Matteucci, S. Grisanti, A. M. Gianni. 2002. Human bone marrow stromal cells suppress T-lymphocyte proliferation induced by cellular or nonspecific mitogenic stimuli. Blood 99: 3838-3843. Krampera, M., S. Glennie, J. Dyson, D. Scott, R. Laylor, E. Simpson, F. Dazzi. 2003. Bone marrow mesenchymal stem cells inhibit the response of naive and memory antigen-specific T cells to their cognate peptide. Blood 101: 3722-3729. Le Blanc, K., I. Rasmusson, B. Sundberg, C. Götherström, M. Hassan, M. Uzunel, O. Ringdén. 2004. Treatment of severe acute graft-versus-host disease with third party haploidentical mesenchymal stem cells. Lancet 363: 1439-1441. Djouad, F., P. Plence, C. Bony, P. Tropel, F. Apparailly, J. Sany, D. Noel, C. Jorgensen. 2003. Immunosuppressive effect of mesenchymal stem cells favors tumor growth in allogeneic animals. Blood 102: 3837-3844. Meisel, R., A. Zibert, M. Laryea, U. Göbel, W. Däubener, D. Dilloo. 2004. Human bone marrow stromal cells inhibit allogeneic T-cell responses by indoleamine 2,3-dioxygenase-mediated tryptophan degradation. Blood 103: 4619-4621. Tse, W. T., J. D. Pendleton, W. M. Beyer, M. C. Egalka, E. C. Guinan. 2003. Suppression of allogeneic T-cell proliferation by human marrow stromal cells: implications in transplantation. Transplantation 75: 389-397. Potian, J. A., H. Aviv, N. M. Ponzio, J. S. Harrison, P. Rameshwar. 2003. Veto-like activity of mesenchymal stem cells: functional discrimination between cellular responses to alloantigens and recall antigens. J. Immunol. 171: 3426-3434. Xu, G., L. Zhang, G. Ren, Z. Yuan, Y. Zhang, R. C. Zhao, Y. Shi. 2007. Immunosuppressive properties of cloned bone marrow mesenchymal stem cells. Cell Res. 17: 240-248. Majumdar, M. K., M. A. Thiede, J. D. Mosca, M. Moorman, S. L. Gerson. 1998. Phenotypic and functional comparison of cultures of marrow-derived mesenchymal stem cells (MSCs) and stromal cells. J. Cell. Physiol. 176: 57-66. Sallusto, F., A. Lanzavecchia. 1994. Efficient presentation of soluble antigen by cultured human dendritic cells is maintained by granulocyte/macrophage colony-stimulating factor plus interleukin 4 and downregulated by tumor necrosis factor α. J. Exp. Med. 179: 1109-1118. Caux, C., C. Dezutter-Dambuyant, D. Schmitt, J. Banchereau. 1992. GM-CSF and TNF-α cooperate in the generation of dendritic Langerhans cells. Nature 360: 258-261. Caux, C., C. Massacrier, B. Vanbervliet, B. Dubois, I. Durand, M. Cella, A. Lanzavecchia, J. Banchereau. 1997. 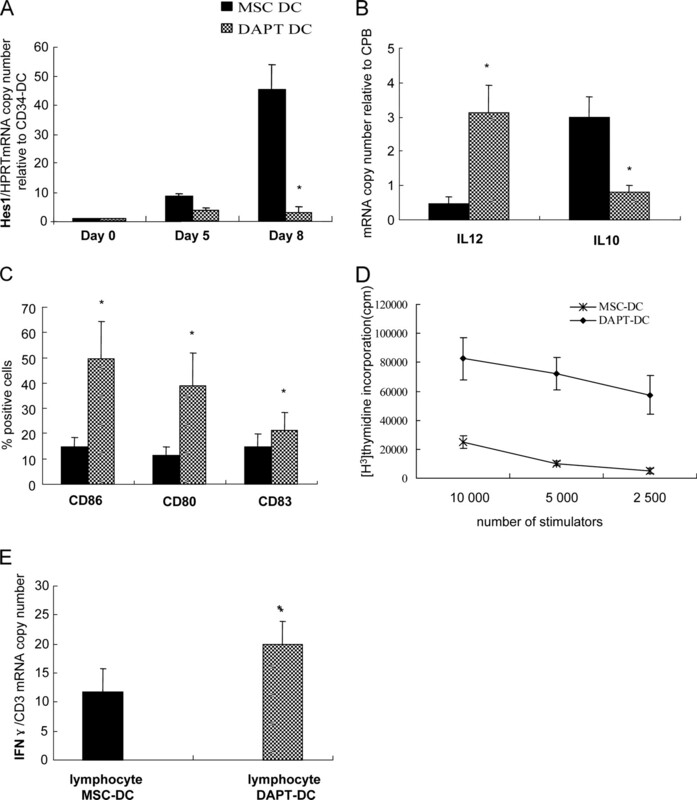 CD34+ hematopoietic progenitors from human cord blood differentiate along two independent dendritic cell pathways in response to granulocyte-macrophage colony-stimulating factor plus tumor necrosis factor alpha: II. Functional analysis. Blood 90: 1458-1470. Liu, Y. J., H. Kanzler, V. Soumelis, M. Gilliet. 2001. Dendritic cell lineage, plasticity and cross-regulation. Nat. Immunol. 2: 585-589. Dhodapkar, M. V., R. M. Steinman, J. Krasovsky, C. Munz, N. Bhardwaj. 2001. Antigen-specific inhibition of effector T cell function in humans after injection of immature dendritic cells. J. Exp. Med. 193: 233-238. Jiang, X. X., Y. Zhang, B. Liu, S. X. Zhang, Y. Wu, X. D. Yu, N. Mao. 2005. Human mesenchymal stem cells inhibit differentiation and function of monocyte-derived dendritic cells. Blood 105: 4120-4126. Nauta, A. J., A. B. Kruisselbrink, E. Lurvink, R. Willemze, W. E. Fibbe. 2006. Mesenchymal stem cells inhibit generation and function of both CD34+-derived and monocyte-derived dendritic cells. J. Immunol. 177: 2080-2087. Aggarwal, S., M. F. Pittenger. 2005. Human mesenchymal stem cells modulate allogeneic immune cell responses. Blood 105: 1815-1822. Cheng, P., Y. Nefedova, L. Miele, B. A. Osborne, D. Gabrilovich. 2003. Notch signaling is necessary but not sufficient for differentiation of dendritic cells. Blood 102: 3980-3988. Cheng, P., Y. Nefedova, C. A. Corzo, D. I. Gabrilovich. 2007. Regulation of dendritic-cell differentiation by bone marrow stroma via different Notch ligands. Blood 109: 507-515. Olivier, A., E. Lauret, P. Gonin, A. Galy. 2006. The Notch ligand delta-1 is a hematopoietic development cofactor for plasmacytoid dendritic cells. Blood 107: 2694-2701. Geling, A., H. Steiner, M. Willem, L. Bally-Cuif, C. Haass. 2002. A gamma-secretase inhibitor blocks Notch signaling in vivo and causes a severe neurogenic phenotype in zebrafish. EMBO Rep. 3: 688-694. Pachot, A., J. L. Blond, B. Mougin, P. Miossec. 2004. Peptidylpropyl isomerase B (PPIB): a suitable reference gene for mRNA quantification in peripheral whole blood. J. Biotechnol. 114: 121-124. Iso, T., L. Kedes, Y. Hamamori. 2003. HES and HERP families: multiple effectors of the Notch signaling pathway. J. Cell. Physiol. 194: 237-255. Beyth, S., Z. Borovsky, D. Mevorach, M. Liebergall, Z. Gazit, H. Aslan, E. Galun, J. Rachmilewitz. 2005. Human mesenchymal stem cells alter antigen-presenting cell maturation and induce T-cell unresponsiveness. Blood 105: 2214-2219. Chomarat, P., J. Banchereau, J. Davoust, A. K. Palucka. 2000. IL-6 switches the differentiation of monocytes from dendritic cells to macrophages. Nat. Immunol. 1: 510-514. Zhang, M., H. Tang, Z. Guo, H. An, X. Zhu, W. Song, J. Guo, X. Huang, T. Chen, J. Wang, X. Cao. 2004. Splenic stroma drives mature dendritic cells to differentiate into regulatory dendritic cells. Nat. Immunol. 5: 1124-1133. Maccario, R., M. Podestà, A. Moretta, A. Cometa, P. Comoli, D. Montagna, L. Daudt, A. Ibatici, G. Piaggio, S. Pozzi, et al 2005. Interaction of human mesenchymal stem cells with cells involved in alloantigen-specific immune response favors the differentiation of CD4+ T-cell subsets expressing a regulatory/suppressive phenotype. Haematologica 90: 516-525. Kubsch, S., E. Graulich, J. Knop, K. Steinbrink. 2003. Suppressor activity of anergic T cells induced by IL-10-treated human dendritic cells: association with IL-2- and CTLA-4-dependent G1 arrest of the cell cycle regulated by p27Kip1. Eur. J. Immunol. 33: 1988-1997. Sato, K., N. Yamashita, M. Baba, T. Matsuyama. 2003. Modified myeloid dendritic cells act as regulatory dendritic cells to induce anergic and regulatory T cells. Blood 101: 3581-3589.